Objectives: Brain scintigraphy with Tc-99m-labeled diethylenetriaminopenta-acetic acid is a sensitive diagnostic method showing loss of cerebral blood flow that occurs after brain death. Cerebral blood flow can be quantitatively estimated by this method. The aim of this study was to compare histopathologic changes occurring with the decrease of cerebral blood flow (as shown by Tc-99m-labeled diethylenetriaminopenta-acetic acid brain death scintigraphy) after brain death in an experimental model. Materials and Methods: The study included examination of cerebral blood flow by Tc-99m-labeled diethylenetriaminopenta-acetic acid brain scintigraphy in the 20 rats, 1 day before brain death, after producing brain death in 11 surviving rats. Tc-99m-labeled diethylenetriaminopenta-acetic acid brain scintigraphy was performed under intubation and monitored. The Mann-Whitney U test was performed to compare groups (scintigraphic quantification results before and after brain death). Results: In the time activity curves generated from the analysis of the scintigraphies, decreases in counts in the brain death group were obtained in the arterial phase (P < .01). Decreases of the cerebral blood flow between the first and the sixth minutes were statistically significant (P < .05). Common principal histopathologic changes of the brain death (ie, autolysis and color loss in the nerve cells, diffuse edema, petechial hemorrhage in the brain tissues) were observed in all subjects. Conclusions: Quantitative findings of the brain scintigraphy by Tc-99m-labeled diethylenetri­aminopenta-acetic acid was related with the histopathologic findings seen during the early brain death, with significant decreases of the cerebral blood flow. Quantification of Tc-99m-labeled diethylenetriaminopenta-acetic acid brain death scintigraphy as an easier and less-expensive scintigraphic method of cerebral blood flow might indicate a definite diagnosis of brain death and thus, potential donors can be determined earlier, leaving to increased transplant rates. Brain death includes neurologic catastrophic injury, without conflicting medication or medical condition, with body temperature above 36°C.1 Determining brain death is a critical decision that has important aspects. Because the brain death involves a series of unwanted effects on the vital organs of a potential donor, the time needed to diagnose brain death must be short to protect the organs. However, there are some borderline patients that make the decision of brain death significantly difficult. Brain perfusion scintigraphy has been considered the standard test for many years, but the criterion standard evaluation for diagnosing brain death is cerebral angiography.4 Confirming brain death by nuclear medicine methods includes brain perfusion scintigraphy with brain specific agents and analyzing the blood supply to the brain by nonspecific agents. Brain perfusion scintigraphy with Tc-99m hexamethyl­p­ropylene-aminoxime (HMPAO) provides a better definition of brain death with the absence of brain perfusion, which recently has become the preferred method. However, because the HMPAO is expensive and sometimes unavailable, radiophar­maceutical agent, and this imaging technique, have specific requirements, which are less practical. Rapid evaluation and availability of the method in investigating brain death is crucial because the time required to diagnose brain death is extremely important to salvage organs for transplant. Additionally, to the best of our knowledge, histopathologic confirmation of brain death has not been performed previously when comparing scintigraphy results. We aimed to analyze the diagnostic efficiency of brain death scintigraphy with a brain nonspecific agent (Tc-99m DTPA), comparing histopathologic results in brain dead rats. Twenty Sprague-Dawley rats (2-to 3-mo old, approximately 250-300 g) were included in the study. All animal protocols were approved by Institutional Animal Care and Use Ethic Committee. The study was conducted according to National Institutes of Health Guide for the Care and Use of Laboratory Animals and Helsinki Declaration revised in 2008. All of the animals were killed after the study. Sedation was performed by intramuscular adminis­tration of 35 mg/kg ketamine and 10 mg xylazine before all the imaging and surgical procedures were done. Dynamic brain imaging was performed before and after brain death. First, scintigraphy was performed 1 day before death production to exclude the influence of activity that may have remained after the first scintigraphy to the second scintigraphy. The imaging was performed by a SPECT gamma camera (General Electric, Infinia 2, Israel) equipped with low-energy high-resolution collimator in 64 × 64 matrix in dynamic (first 10 min) and static manner (for 5 min) after IV administration of 100 μCi Tc-99m DTPA via a venous line in the tail. Interpretation of the scintigraphy images was performed by an experienced nuclear medicine physician. Additionally quantification was performed from the counts in the time activity curves that were generated from the region of interests drawn from the brain and background (hind limb) region (Figures 1A and B). Brain death was produced by the localization of a balloon catheter (4-F Fogarty catheter) into the intracranial cavity via a burr hole between parietal bones, filling the catheter with 0.5 mL saline infusion until the maximal pupil dilatation, apnea, and loss of reflexes were observed as previously described.5 Intubation was performed from tracheostomy cannula, which was previously generated. The second scintigraphy was performed under intubation and monitored. Immediately after scintigraphy, we killed the rats, and the brain tissue was removed for pathologic analysis. Tokyo, Japan) with ×400 magnification and ×100 magnification in 10 different areas. Numeric variables (counts) that were obtained from the time activity curves of scintigraphy images were compared by Mann-Whitney U test, and P < .05 was considered significant. In the visual interpretation of scintigraphies, the loss of brain vascularity was not observed. The time activity curves obtained by brain scintigraphies in the control and brain death groups indicated the drop of counts in the vascular phase and in the first 6 minutes of the study after brain death (Figures 1A and B). The net brain counts were extracted by subtracting the background counts from the brain counts. 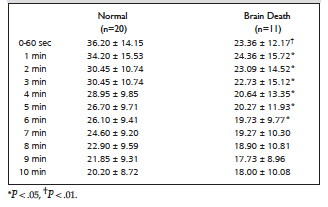 Comparing the net braincounts of 11 living rats, significant differences were observed between the studies in arterial phase (P < .01) and in first to 6 minutes (P < .05) (Table 1). Histopathologic analysis confirmed brain death in all of the subjects with typical marks of brain death, including severe autolysis, hydropic degeneration in cytoplasm, shrinkage in the nucleus, pyknosis, and petechial hemorrhage all over the brain in pericellular space (Figure 2). So far as we know, histopathologic confirmation of the scintigraphic results in brain death have not been performed before. The results of this study indicate that brain death scintigraphy by means of nonspecific brain agents is an accurate method. Although visual analysis of the brain scintigraphy in rats by Tc-99m DTPA did not reveal sufficient information, the time activity curves in the first 6 minutes of the study clearly indicates brain death with a statistically significant difference. Our results may lead confirming that brain death imaging by means of nonspecific brain agents and thus, a better understanding of brain death by this imaging method might be possible. Despite clinical tests and angiography results confirming brain death, in previous studies, it has been indicated in some patients that there might be some brain activity (regular vasopressin secretion or maintained pituitary gland or hypothalamus).18,19 Additionally, in a previous neuropathology study, in patients with brain death who received the diagnosis with only clinical tests, approximately two-thirds of the patients had moderate-to-severe ischemia in the cortical tissues and less than half in the brainstem.20 Thus, there are arguments about the reliability and pathologic confirmation of brain death.21 That is why we planned to demonstrate pathologic confirmation of brain death in scintigraphically positive subjects in our study. Diagnosing brain death is critical for a human being, and for the patients’ family; thus, a certain diagnosis is a necessity. In another aspect, the loss of potential organs for transplant is unwanted, so the rapid and correct diagnosis of brain death is crucial for estimating potential donors. The limitation of this study was insufficient visual interpretation opportunity. Because Tc-99m DTPA is a nonspecific imaging agent for brain tissue, visual interpretation of the small animals (rats) was impossible by means of this method, and this is a limitation. This issue warrants further investigation into confirming brain death with specific brain agents like Tc-99m HMPAO, and if possible, neuropathologic studies in human brain death, with correlation of scintigraphy would increase the confidence and understanding of brain death pathogenesis and diagnosis. Tc-99m-labeled diethylenetriaminopenta-acetic acid brain death scintigraphy with quantification provide sufficient information regarding brain death with histopathologic confirmation in rats. It may serve as an easier, less-expensive, and more available method in determining brain death and providing faster alternative, thereby leading to increased transplant rates. Wijdicks EF, Varelas PN, Gronseth GS, Greer DM; American Academy of Neurology. Evidence-based guideline update: determining brain death in adults: report of the Quality Standards Subcommittee of the American Academy of Neurology. Neurology. 2010;74(23):1911-1918. doi: 10.1212/WNL.0b013e3181e242a8. Guignard NG, Gardner AI, Baker S, Van Heerden PV. Brain death determination in Australia and New Zealand: a survey of intensive care units. Crit Care Resusc. 2011;13(4):271-273. Kim AC, Colletti PM. Perfusion "brain death" scintigraphy in traumatic and hypoxic cerebral insults: correlation with CT. Clin Nucl Med. 2012;37(9):880-888. doi: 10.1097/RLU.0b013e318262c799. Donatelli LA, Geocadin RG, Williams MA. Ethical issues in critical care and cardiac arrest: clinical research, brain death, and organ donation. Semin Neurol. 2006;26(4):452-459. Simas R, Sannomiya P, Cruz JW, et al. Paradoxical effects of brain death and associated trauma on rat mesenteric microcirculation: an intravital microscopic study. Clinics (Sao Paulo). 2012;67(1):69-75. Orban JC, El-Mahjoub A, Rami L, Jambou P, Ichai C. Transcranial Doppler shortens the time between clinical brain death and angiographic confirmation: a randomized trial. Transplantation. 2012;94(6):585-588. Berenguer CM, Davis FE, Howington JU. Brain death confirmation: comparison of computed tomographic angiography with nuclear medicine perfusion scan. J Trauma. 2010;68(3):553-559. doi: 10.1097/TA.0b013e3181cef18a. Lamb T, Arumaithurai K, Shastri R, Putta S. The The case for brain death determination by CTA: where are the results? J Trauma Acute Care Surg. 2012;72(4):1123. doi: 10.1097/TA.0b013e318247885a. Webb A, Samuels O. Brain death dilemmas and the use of ancillary testing. Continuum (Minneap Minn). 2012;18(3):659-668. doi: 10.1212/01.CON.0000415434.91771.9b. Roberts DJ, MacCulloch KA, Versnick EJ, Hall RI. Should ancillary brain blood flow analyses play a larger role in the neurological determination of death? Can J Anaesth. 2010;57(10):927-935. doi: 10.1007/s12630-010-9359-4. de Freitas GR, André C. Sensitivity of transcranial Doppler for confirming brain death: a prospective study of 270 cases. Acta Neurol Scand. 2006;113(6):426-432. Welschehold S, Boor S, Reuland K, et al. Technical aids in the diagnosis of brain death: a comparison of SEP, AEP, EEG, TCD and CT angiography. Dtsch Arztebl Int. 2012;109(39):624-630. doi: 10.3238/arztebl.2012.0624. Ruess D, Rieger B, Goldbrunner R, Schlacke HP. Pitfalls in brain death diagnosis: a case report. J Neurol Surg A Cent Eur Neurosurg. 2013;74(3):192-196. doi: 10.1055/s-0032-1322520. Joffe AR, Lequier L, Cave D. Specificity of radionuclide brain blood flow testing in brain death: case report and review. J Intensive Care Med. 2010;25(1):53-64. Flowers WM Jr, Patel BR. Radionuclide angiography as a confirmatory test for braindeath: a review of 229 studies in 219 patients. South Med J. 1997;90(11):1091-1096.
de la Riva A, González FM, Llamas-Elvira JM, et al. Diagnosis of brain death: superiority of perfusion studies with 99Tcm-HMPAO over conventional radionuclide cerebral angiography. Br J Radiol. 1992;65(772):289-294. Sinha P, Conrad GR. Scintigraphic confirmation of brain death. Semin Nucl Med. 2012;42(1):27-32. doi: 10.1053/j.semnuclmed.2011.07.007. Odetola FO, Gebremariam A, Davis MM. Comorbid illnesses among critically ill hospitalized children: Impact on hospital resource use and mortality, 1997-2006. Pediatr Crit Care Med. 2010;11(4):457-463. doi: 10.1097/PCC.0b013e3181c514fa. Kanter RK. Adding to the health services research toolbox. J Pediatr. 2004;144(5):562-564. Feudtner C, Christakis DA, Connell FA. Pediatric deaths attributable to complex chronic conditions: a population-based study of Washington State, 1980-1997. Pediatrics. 2000;106(1 Pt 2):205-209. Truog RD, Miller FG. Brain perfusion scans to diagnose brain death: more than meets the eye. Pediatr Crit Care Med. 2010;11(4):527-528. doi: 10.1097/PCC.0b013e3181d505ad. Acknowledgements: The abstract of this study was presented as a poster at the 23th National Congress of Nuclear Medicine in April 6-10, 2013 in Antalya, Turkey. The authors declare that they have no conflicts of interest; they also received no funding for this study. Figure 1A. 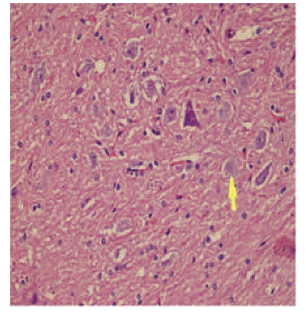 Marked Hydropic Degeneration (Arrow) in Neuronal Cells (H&E ×200).